Arlene Ruth Dittmar, 86 of David City, died Thursday, September 22, 2016 at david place in David City. Arlene was born December 7, 1929, in Rising City, to Werner and Frieda(Richert) Rathje. She was baptized and confirmed at St. John's Lutheran Church, rural Rising City. 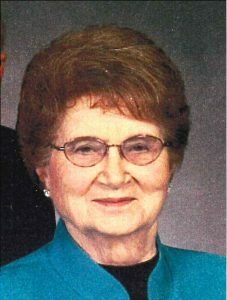 She received her elementary education at Cottonwood School District 4, graduated from Surprise High School in 1947 and earned a Teaching Certificate from Concordia Teachers College. She taught for four years at Greenleaf District 52. On June 3, 1951, she married Robert Dittmar at St. John's. They were blessed with three children. Arlene was a member Immanuel Lutheran Church, taught Sunday School and Midweek School and was a member of the Immanuel Lutheran Ladies Aid. She also was a 4-H leader several years and active in the Mother's Club of her son's fraternity. She enjoyed cooking, baking and entertaining. She liked to travel, spend time with family and enjoyed tracing and recording their family history. She worked at the Good Samaritan Home in Osceola and david place in David City. Robert and Arlene lived and farmed in the Surprise/Rising City area until moving to David City in 2003. Arlene is survived by her husband, Robert, daughters Rhonda(John) White, Lincoln, Rena Rech(Joe Truksa) David City, son Rod Dittmar of Greenwood Village, Colorado, grandchildren ;Branden(Cassie) Rech, Ashland, Amber(Curt) Hobscheidt of Olathe, KS, Kaleb(Crescencia) White and Leah Bucco-White(Peter Morris), all of Lincoln, great-grandchildren Halle and Kenna and Lennyn Ruth Rech, Gianna and Oliver Morris, brother Norbert(Joyce) Rathje, Rising City and sisters-in-law Paula Rathje and Doris(Robert) Pollock, Lincoln, many nieces and nephews. She was preceded in death by her parents, brother Norman Rathje, sisters-in-law Dorothea(John) Pollock and Luella(Dale) Busse.